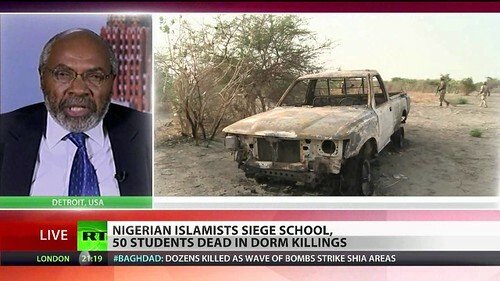 Abayomi Azikiwe, editor of the Pan-African News Wire, on RT worldwide satellite news television station. Azikiwe is a frequent contributor to international media., a photo by Pan-African News Wire File Photos on Flickr. A split within the ruling Sudan People’s Liberation Movement/Army (SPLM/A) has grown into an armed conflict in the world’s most recently recognized nation. Since December 15 fighting has erupted in the capital of Juba and within the states of Jonglei, Warrap, Central Equatoria, Eastern Equatoria and Unity between forces loyal to President Salva Kiir and ousted Vice-President Riek Machar. In the aftermath of the escalation of fighting, the United Nations Secretary General Ban Ki-moon stated that peacekeeping forces would be doubled inside the vast country to nearly 14,000 personnel. A delegation of representatives from several East African states sought to mediate the conflict and reportedly reached an agreement with the two contending forces to hold peace talks. In a much anticipated announcement by President Kiir announcing a unilateral ceasefire, an agreement has supposedly been reached on December 27 to end the fighting that has killed over 1,000 people and dislocated tens of thousands of others. Conflicting reports over who is controlling the oil-producing areas of Unity state has caused great concern on the part of the U.S. and other western governments. The Republic of South Sudan came into being in July 2011 after Africa’s largest geographic nation-state, the Republic of Sudan, was partitioned at the aegis of the U.S. government which backed Juba in its two-decade armed and political struggle against Khartoum in the North. Since the break-up of the country there has been ongoing conflicts between Juba and Khartoum over border demarcations, allegations of support for rebel groups within the respective states and the exploitation, export and distribution of oil, the main foreign exchange generator for both countries. Even within South Sudan itself, problems have escalated since 2011 between various ethnic groups over allocations of governmental portfolios as well as allegations of widespread corruption and abuse of power. President Kiir accused Machar of attempting a coup against his government and proceeded to arrested some of the leading politicians in the country who were presumed to be loyal to the sacked Vice-President removed from office in July 2013. Machar has stated that he will contest the upcoming 2015 national presidential elections. He is demanding that all of the politicians arrested in the recent crackdown by President Kiir be released prior to the beginning of serious peace talks. The power struggle within the SPLM/A has spilled over into the military. General Peter Yaak based in Jonglei state has pledged his allegiance to Machar along with others who seized control of the lucrative oil fields in Unity state. Kiir said during the week of December 24 that the oil fields were once again in the control of forces still loyal to the central government. Meanwhile civilians have fled in the tens of thousands seeking refuge from the intense fighting between the two factions within the military. Nonetheless, other reports indicate that forces loyal to Machar are still holding the oil fields in Unity state at Bentiu. The government in Juba says that it will hold off on an offensive in Unity state pending the outcome of talks in Nairobi. ‘‘We are not moving on Bentiu as long as the rebel forces abide by the cease-fire,’’ said Michael Makuei Lueth, South Sudan’s information minister. Although this statement was made by a leading cabinet official the military has provided an analysis of the situation which conflicts with Lueth. Military spokesman Col. Philip Aguer stressed that “We have not seen any sign of a cease-fire. There is no cease-fire agreed by the two sides,’’ which could indicate that the planned assault on Bentiu will still take place. In another area of the country the military advanced on the rebel-held town of Malakal early on December 27 and had seized control of it by noon, Aguer claimed. The administration of President Barack Obama has already sent dozens of Pentagon troops into South Sudan to supposedly evacuate American citizens and to assist UN peacekeeping and humanitarian operations. An additional 150 troops have been reportedly sent to Djibouti where the U.S. maintains a military base to await deployment to South Sudan. A meeting in Nairobi, Kenya on December 27 among representatives of the Inter-Governmental Authority on Development (IGAD) told the opposition forces loyal to Machar that they would not tolerate the overthrow of the South Sudan regime under President Kiir. As an affiliate organization of the continental African Union (AU), the organization composed of 53 states is mandated to suspend and isolate any government that seizes power by force. Representatives at the Nairobi meeting on December 27 included heads-of-state from Uganda, Ethiopia, Somalia and Djibouti in addition to the host Kenya. The Kenyan leader went on to say that the factional fighting must cease immediately. "We have a very small window of opportunity to secure peace, which we urge all stakeholders to seize, including [Riek] Machar," he emphasized. Prior to the partition of Sudan, for over a decade the U.S. was largely excluded from the production and distribution of oil in this African state. The bulk of the oil concessions in the Republic of Sudan were controlled by the People’s Republic of China and other countries in the Middle East and Asia. Prior to the division of the country, Sudan was producing approximately 500,000 barrels-per-day in oil. Since the partition and the resulting disruptions in production due to disagreements and conflicts between Juba and Khartoum, oil production has dropped drastically in both states. In the North, the precipitous decline in oil export revenues has forced the government to impose austerity measures including the elimination of fuel subsidies, prompting inflation. The sharp rise in prices for oil and other basic commodities has sparked protests and rebellions that have been utilized by the opposition forces seeking the overthrow of the National Congress Party (NCP) government of President Bashir. Since the break-up of the country the U.S. is eager to reenter the oil production process in South Sudan. Japan has also expressed interests in building a pipeline so that South Sudanese oil can flow through neighboring Kenya in an effort to bypass the government of President Omar Hassan al-Bashir in Khartoum. U.S. Ambassador to South Sudan Susan Page said there was growing interest in the South Sudanese oil sector. Consequently, there is a strong incentive for Washington to enter the country on a broader level.